I think I found Alaska in the 90s. This is the second John Green book I've read, and I would say I enjoyed it. It didn't hold up to "The Fault In Our Stars", but it was still pretty good. The main thing that I couldn't get out of my head was this voice saying, "Dude, doesn't that remind you of 'Perks of Being a Wallflower'?" I would then shrug it off, and continue reading, but then it would come back to me, "Hey, dude, seriously think about this. Isn't it crazy how the Colonel has the same kind of loud and in-your-face attitude as Patrick? And that Alaska, she totally has the same edgy thing going as Sam, don't you think? And go figure Pudge gets pulled in with them since he is the kind of weird kid who didn't fit in before he met them!" I'm sorry, to be fair, this book really can't be called the same. The characters have different relationships, the plot is its own, and the setting is unique. Got to love the Eagle and his swooping ways. 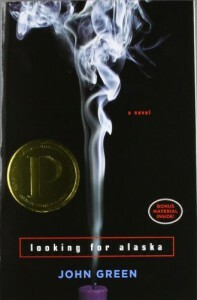 For me, though, I just couldn't stop making the POBAW comparisons, and I can't help but wonder if anyone who has read "Looking for Alaska" then went on to read POBAW and was all like, "Hey, this book is really similar to 'Looking for Alaska'!" I do like John Green as a writer. He writes well and I love how many non-readers find his material accessible. His books speak to several teens in this generation, and I can see why in the writing. I've been making it sound like a bad thing that "Alaska" reminds me of POBAW, but it is actually a good thing. It feels like John Green got the heart of Chbosky's book that wooed so many, and Green gave it a new voice for the next generation. Good work, John. I simply feel an attachment to the 90s that can't be broken, and that isn't "Looking for Alaska"'s fault, it just means I have a bias to like POBAW more than I probably should. Looking forward to my next John Green. I think I'll either go for "Will Grayson, Will Grayson" or "An Abundance of Katherines" the next time I'm in the mood for some teen-reads.